We examined the associations of mammographic breast density with breast cancer risk by tumor aggressiveness and by menopausal status and current postmenopausal hormone therapy. This study included 2596 invasive breast cancer cases and 4059 controls selected from participants of four nested case–control studies within four established cohorts: the Mayo Mammography Health Study, the Nurses’ Health Study, Nurses’ Health Study II, and San Francisco Mammography Registry. Percent breast density (PD), absolute dense (DA), and non-dense areas (NDA) were assessed from digitized film-screen mammograms using a computer-assisted threshold technique and standardized across studies. 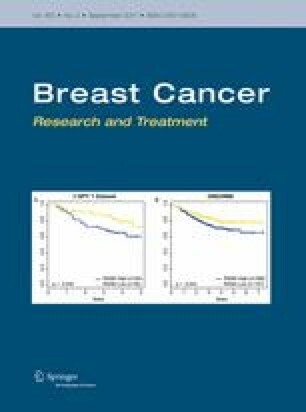 We used polytomous logistic regression to quantify the associations of breast density with breast cancer risk by tumor aggressiveness (defined as presence of at least two of the following tumor characteristics: size ≥2 cm, grade 2/3, ER-negative status, or positive nodes), stratified by menopausal status and current hormone therapy. Overall, the positive association of PD and borderline inverse association of NDA with breast cancer risk was stronger in aggressive vs. non-aggressive tumors (≥51 vs. 11–25% OR 2.50, 95% CI 1.94–3.22 vs. OR 2.03, 95% CI 1.70–2.43, p-heterogeneity = 0.03; NDA 4th vs. 2nd quartile OR 0.54, 95% CI 0.41–0.70 vs. OR 0.71, 95% CI 0.59–0.85, p-heterogeneity = 0.07). However, there were no differences in the association of DA with breast cancer by aggressive status. In the stratified analysis, there was also evidence of a stronger association of PD and NDA with aggressive tumors among postmenopausal women and, in particular, current estrogen+progesterone users (≥51 vs. 11–25% OR 3.24, 95% CI 1.75–6.00 vs. OR 1.93, 95% CI 1.25–2.98, p-heterogeneity = 0.01; NDA 4th vs. 2nd quartile OR 0.43, 95% CI 0.21–0.85 vs. OR 0.56, 95% CI 0.35–0.89, p-heterogeneity = 0.01), even though the interaction was not significant. Our findings suggest that associations of mammographic density with breast cancer risk differ by tumor aggressiveness. While there was no strong evidence that these associations differed by menopausal status or hormone therapy, they did appear more prominent among current estrogen+progesterone users. The online version of this article (doi: 10.1007/s10549-017-4341-2) contains supplementary material, which is available to authorized users. This study was supported by the National Institutes of Health (Grant Numbers CA140286 to C. M.V. and K.K., CA087969 to R.M.T., UM1 CA176726 to W.W., UM1 CA186107 to M.S. ), Mayo Clinic Specialized Program of Research Excellence (SPORE) in Breast Cancer (Grant Number P50 CA116201 to M.P.G. and J.N.I. ), Mayo Clinic Cancer Center, and Breast Cancer Research Foundation. We would like to thank the participants and staff of the NHS and NHSII for their valuable contributions as well as the following state cancer registries for their help: AL, AZ, AR, CA, CO, CT, DE, FL, GA, ID, IL, IN, IA, KY, LA, ME, MD, MA, MI, NE, NH, NJ, NY, NC, ND, OH, OK, OR, PA, RI, SC, TN, TX, VA, WA, WY. The authors assume full responsibility for analyses and interpretation of these data. This study was approved by the Institutional Review Boards at the Mayo Clinic, Brigham and Women’s Hospital, and the University of California, San Francisco. Informed consent was obtained or implied by return of questionnaires (NHS, NHSII).